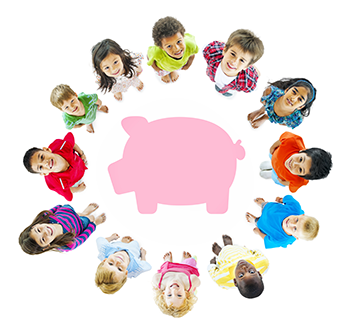 Preschool – Start by using bills and coins to teach them what the value of each is worth. Even if you don't get into the exact values, explain that a quarter is worth more than a dime and a dollar is worth more than a quarter. From there, explain that buying things at the store comes down to a choice based on how much money you have (you can't buy every toy you see!). Also, get them a piggy bank to start saving coins and small bills.